Just this past week, a group of Millennials gathered in King of Prussia, PA for a 2-Day training workshop focused on 10 workplace success skills. As the instructor, it was both amazing and reassuring that all our effort identifying and uncovering generational differences, and building a training program to help young workers (and their employers) is paying off. 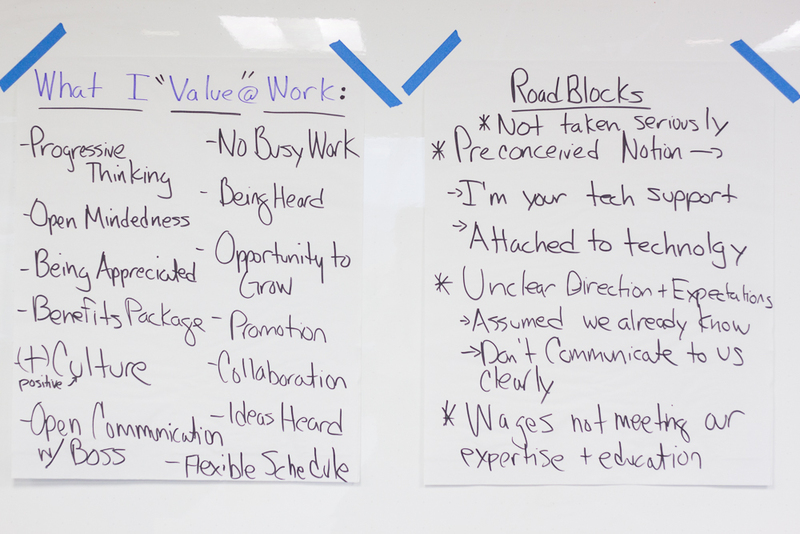 During the training, young workers had the opportunity to voice what they value in a job, as well as roadblocks they experience in the workplace (shown above). The responses from this small group mirror what much of the research shows us about this new generation. Listen up, managers… These values and perceived roadblocks are both important to understand because these young employees will soon make up 75% of your workforce! Succession planning may not be on your mind at the moment, but it will become increasingly important as Baby Boomers retire. And, if you’re looking to attract, retain, motivate and groom these young workers to become leaders, this is information you can’t ignore. What are you doing in your organization to attract, mentor, groom, or train Millennials? I’d really be interested in hearing.